As the new year rolls in and we think up new projects for the rest of the season we’d like to send out a huge thank you to all of our supporters who have kept us going with moral support, financial assistance, sett-checking, random pick-ups when we’re miles from the car, sending in hunt meet cards (another arrived today, second in just over a week – game-changer!) and monitoring hunts themselves. 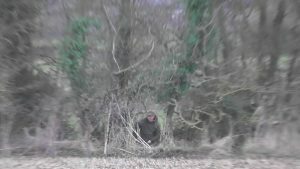 Just today the Cotswold Vale Farmers’ Hunt was discreetly watched by a couple who are visiting the area over New Year and just happened upon the hunt. 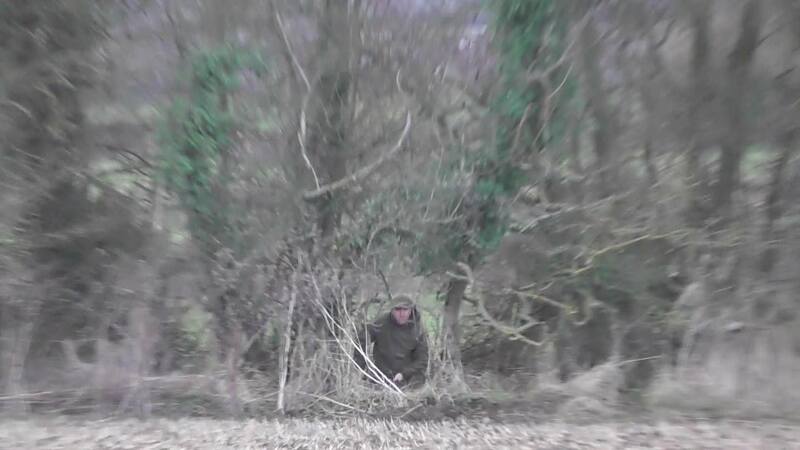 Locals were out over Christmas at various hunt meets keeping an eye on badger setts and on the hounds themselves. As well as regular donations, we’ve been sent cameras and walkie-talkies, even a car at the start of the season(!) and our friends have run stalls at fayres to raise money for the group. Because of all the likes and shares of our posts and the giving out of leaflets and other info at stalls and demonstrations our page likes have gone up so quickly! 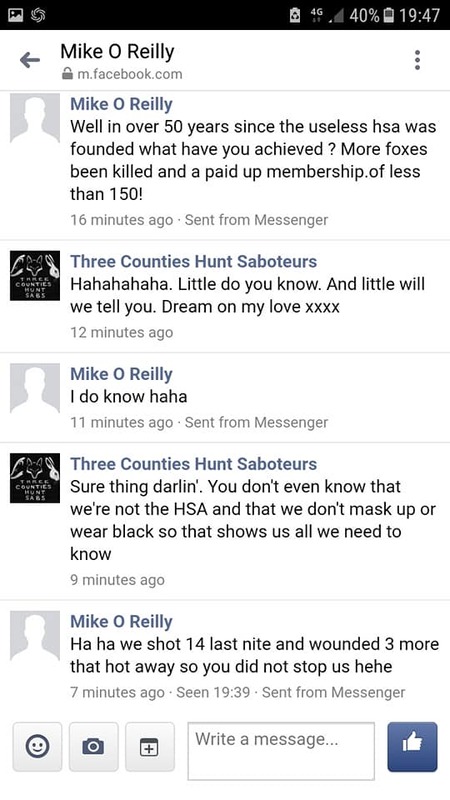 We also have some of our favourite pro-hunt trolls to thank as they comment on nearly all of our posts, often repeating their comments time and time again… but in doing so they’ve made our posts even more popular and we’ve been seen by people who have never liked a post or followed our page before. They also occasionally slip up and give away info. 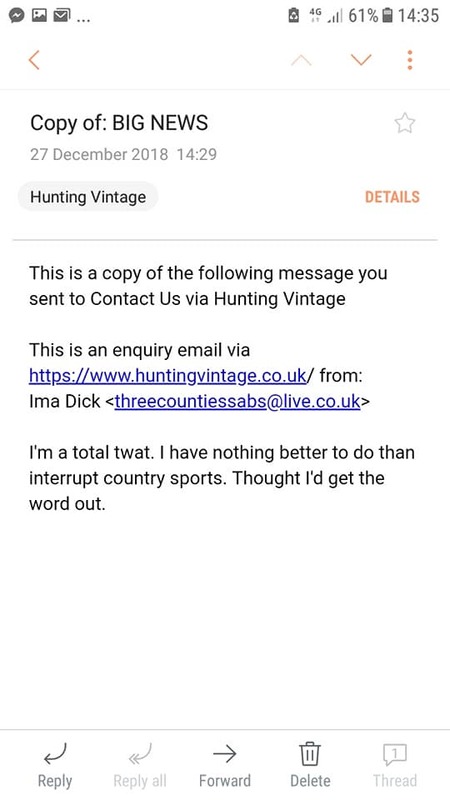 A special thank you goes to the pro-hunt person who decided to waste their own time signing us up to random (useful) websites, especially as we were the 100th ‘sign-up’ that day to one of them and got a massive discount from the site plus free delivery… and we had to do no work towards it. 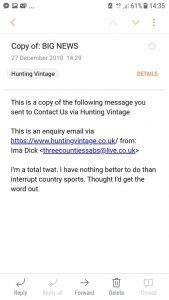 In addition they decided the best way to annoy us would be to send stupid messages to pro-hunt websites using the enquiry forms on their pages meaning that they’ve also wasted the time of those pro-hunt people as they have to sift through fake messages looking for genuine enquiries. And we get emailed copies of all the silly stuff sent for our own amusement. On this solstice day the Ledbury met in the Gloucestershire badger cull zone where the cull this year has been in full swing for the last 6 months (the longest ever). We began pre meet checking setts for signs of both blocking and cull activity. Despite this being the 6th year and the 6th month of culling lots of paw prints and latrines found at some setts. Alas others not looking so active. None that we checked pre- or post-hunt (checking under a full moon is always magical) were found to be blocked. They tried to draw Catsbury Hill first but as we were already ahead of them and had pre-sprayed, huntsman Mark Melladay took them away to try his luck up Limbury Hill. 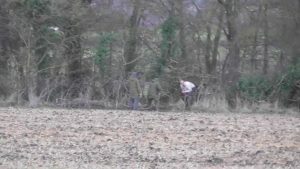 We then encountered our wannabe nemesis David Mansell who tried to round up one sab’ with his horse, despite the fact that he has got into trouble for similar behaviour before. Holding us up for 5 minutes we managed to continue without too much trouble. They did hunt a fox north towards Carter’s Grove but seemed to lose him. They then popped over to Woolridge and then the meadows at Ashleworth where they had a long hunt. As we drew close they had finished and were on their way home. We do not know what happened to that fox. Video posted on facebook in January 2019. It appears from the back window that a blanket was placed over to obscure faces of those smashing, one elderly chap can be seen peering through the broken glass. 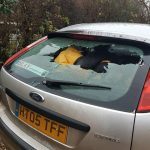 2 side windows were also smashed and a tyre slashed. To the front a spade can be seen smashing into the windscreen with the perpetrator out of sight. A quad bike can also be heard. Villagers told us that a white van drew into the carpark and drove up to the sab car. They retreated for their own safety and called the police with the reg’ number. We have heard various things such as it was visiting Croome supporters. Anyway, we don’t know, neither do the police at this stage. A day shopping and catching up on admin was brought to an abrupt halt when a call about the NCH trespassing came in. One of us got over to Cleeve Prior and after a brief drive and listen thought she could hear hounds marking to ground. 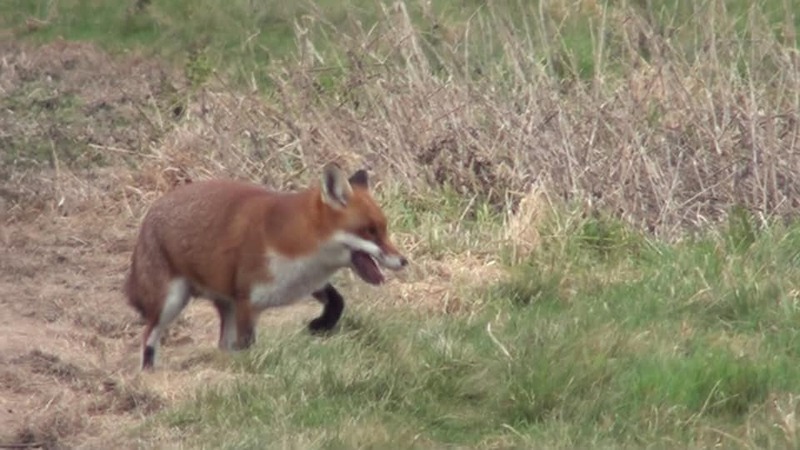 A brief walk inland and trying to pinpoint where they were with both gulls and other dogs making a din lead to concerns that they were digging out a fox due to the length of time the hounds were stationary. When hunts dig out sometimes they have the hounds nearby to hunt the fox again, or in order to feed the fox (alive or dead) to the waiting pack. After a bit of a walk things soon became apparent. 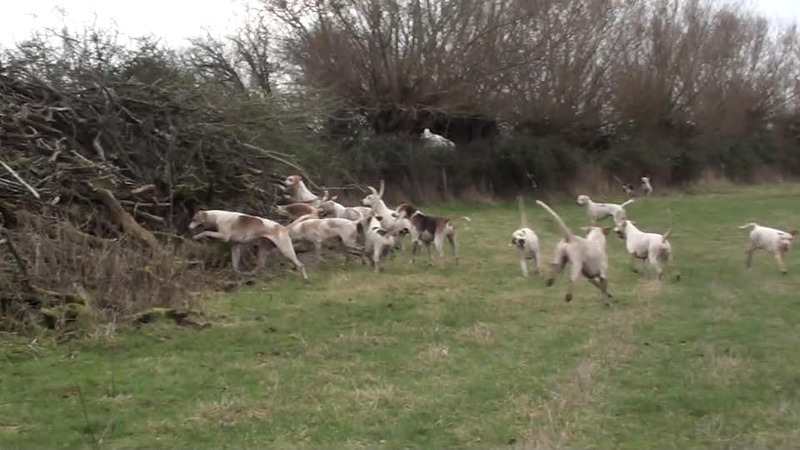 The pack were being held back by the whipper-in and huntsman. The field (what was left of it) were behind a hedge. Just a few yards away 3 men were digging in the woods. A decision was made to make sab’ presence known in order that the terriers be pulled out as soon as possible. However, it became apparent that no terrier and no fox were below ground – the men were just filling in holes. 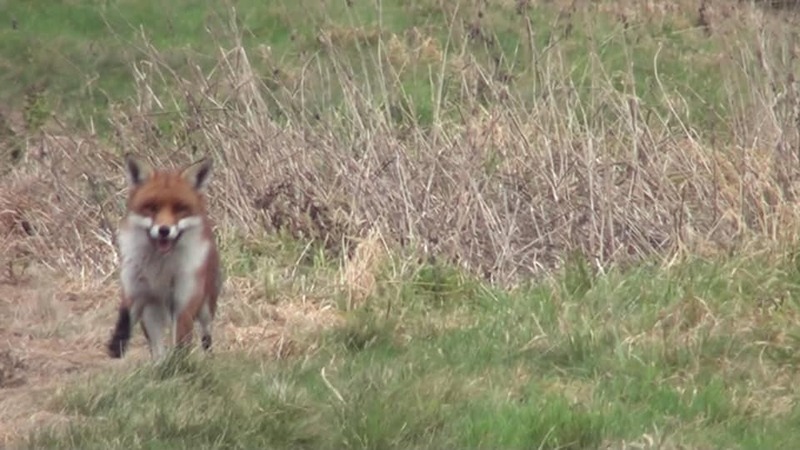 And suddenly there was the fox. Coincidentally popping up at that point or released by the terriermen? 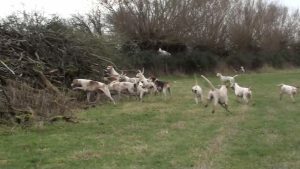 The hounds surged forward all of a sudden and hunted towards the nearest dwellings where they upset residents who were appalled by the cruelty they witnessed. The pack hunted on, it went quiet and the worst is feared… although we have no way of knowing one way or the other of the fate of that fox. 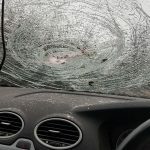 West Mercia police are now dealing with various incidents. 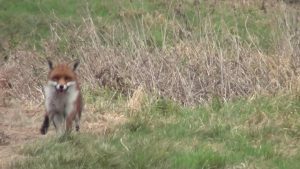 We had received a tip-off that another hunt might be out today and were out and about when we heard that the North Cotswold Hunt had been spotted gathering near Mickleton. We caught up with them early afternoon near Norton Hall but they did a runner from us, hunted a fox across Long Marston Lane and killed in a hedgerow. 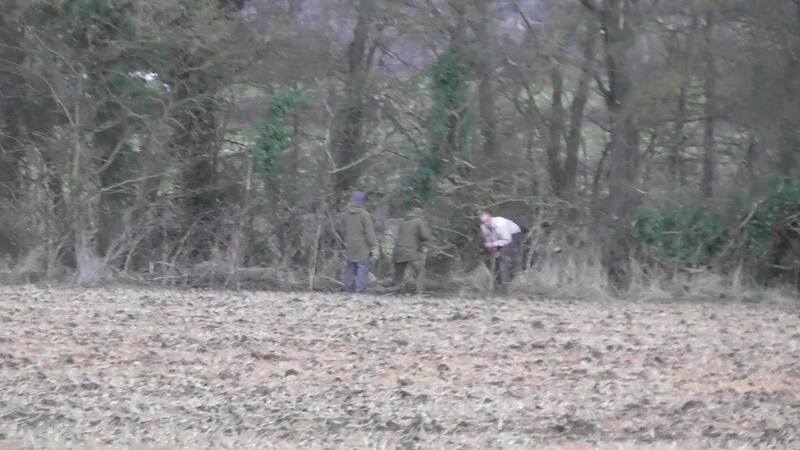 Despite being out until dark several times recently, they have packed up before 3pm today at Clopton Orchard Farm, straight after the kill. 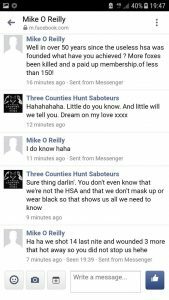 Terriermen picked up the body and ran from the area, local landowner more concerned about whether we had permission to be in the field than the fact there were bits of an illegally killed fox strewn around the hedgeline. 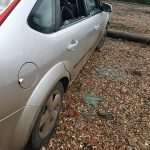 Person renting the next door field finds that her electric fence has been turned off by the hunt, leaving her horses vulnerable to getting out and on to the busy main road!